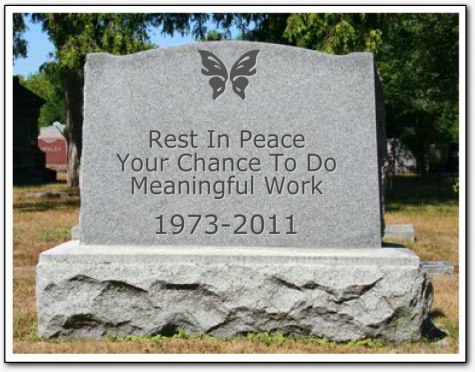 5 responses to Are Meetings Killing Your Ministry? 1) Clear meeting purpose (why are we getting together) . . . and also "commander's intent" . . . what are we trying to accomplish as an organization this season? 2) Clear timeline . . . probably shorter than you think. 3) Stop talking unless you are pushing towards our intent . . .
Nice suggestions Rich. Your #2 above could be applicable to both the subject of most meetings as well as the meeting time itself. Don't you just love meetings that drag on beyond their originally scheduled timeframe? Too many meetings happen out of habit – when a quick conversation or email would suffice. I'm a fan of using stand-up meetings for my teams. We literally stand in a circle to discuss the intent of the meeting. This keep people focussed (hard to use a laptop while standing) and means the meeting goes quicker. My "favorites" are: 1) the meeting facilitator is unprepared 2) stated purpose of the meeting doesn't match the content 3) it's unclear what you want me to do with the old info that we just tossed around because action has not been requested (again) 4) lack of vision — people follow vision even in meetings. Most problems mentioned here come from a diffusion of responsibility, that meetings enable. Although the tactics are important, preparation, purpose, etc…the real answer is leadership. An individual willing to step up assume responsibility, and put themselves on the line.